Just for fun and because i am curious, can we make an thread with the what your non-standard-product systainer looks like and what you use it for. 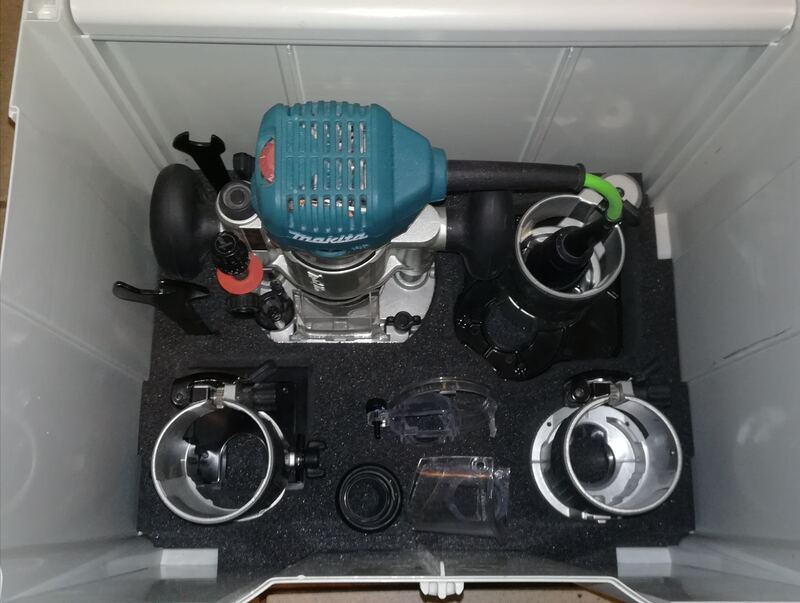 Just for fun to look into the toolboxes of the fellow systainer fan. 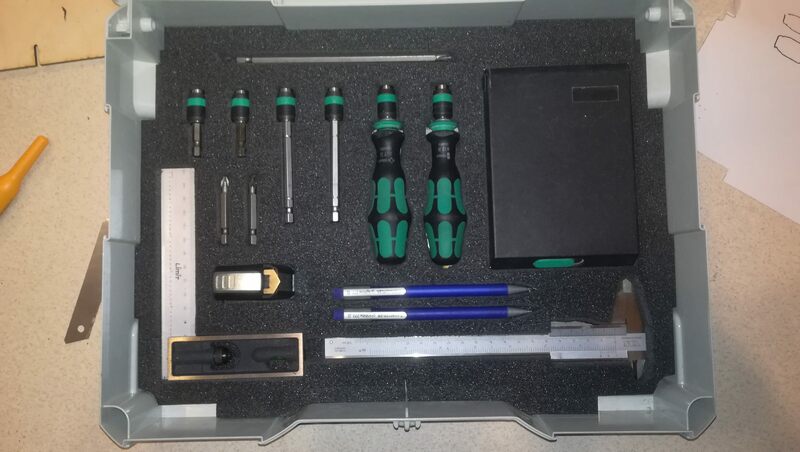 My dovetail cutting tools and chisel/plane blade sharpening equipment. Thank you guys for posting! 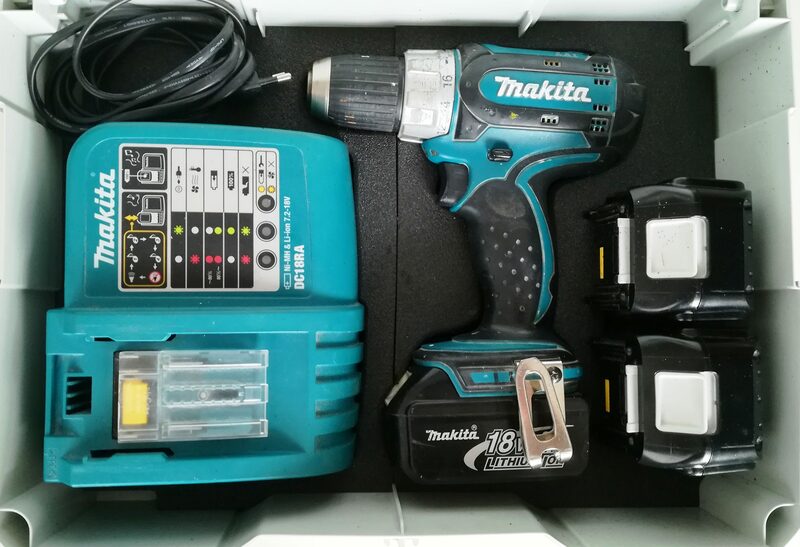 Here's my drill/drive set up. A Sys2 combi with a sortainer. Works great, though it's a bit heavy if you don't throw it on the vac or sys roll. @Vondawg tell us about the handle you added to the T-lock Sys. My trim nailers. Just a simple box with dividers. A few years ago, I rigged up a Sys 5 classic to use for transporting a mixture of hand tools etc. I borrowed ideas from previous FOG poster's. Although I don't make a habit of it, the last time it was full, it weighed 40 lbs. Also rigged up a Midi with my drill/reciprocating saw stuff a few years ago. I added a metal plate and adhesive magnet strips to the lid (inside) for saw blades. The adhesive didn't hold up, so I abandoned that idea. Slick idea with the ties through the lid board. Plumbing, finish guns ,cabinet install equipment ect. Makes packing tools a lot easier. I’ll try a few pics tomorrow. Do Mini Systainers count ? Here's a SYS-Toolbox with Granat hand pads on one side and the other side has several microfiber cloths, a plastic bag with tack rags inside, some rubber sanding forms for curves & profiles, a large soft paintbrush for dusting and several packets of very fine sandpaper. Here are all of my small Bessey clamps in a systainer. 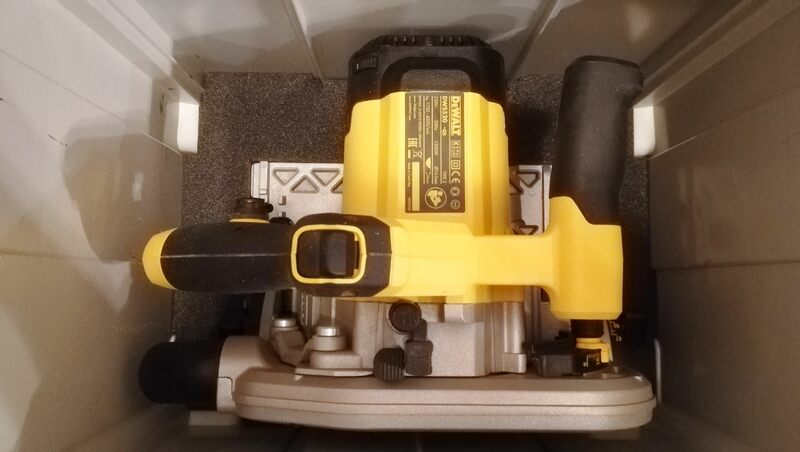 A Tormek sharpener and all the jigs. The jigs are in the box. Here's an OF 1010 with 17" long stainless rods in a SYS-Combi 3. 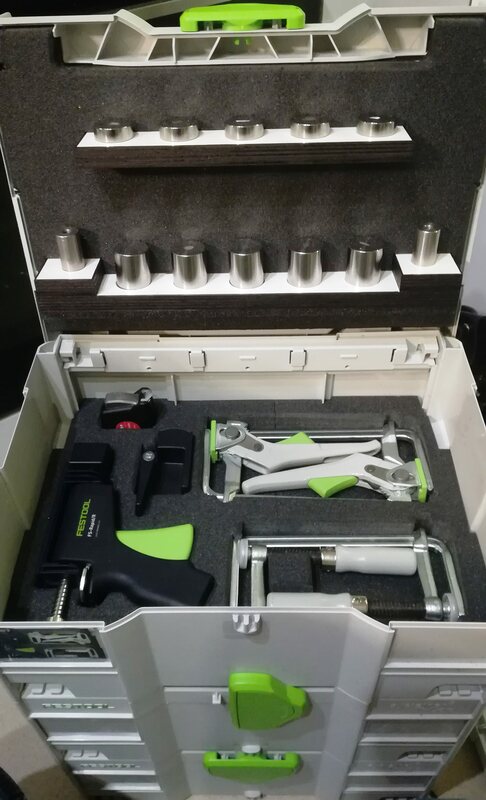 Festool is NOT the only premium price tool but is one of the few that include a rigid box to protect them. 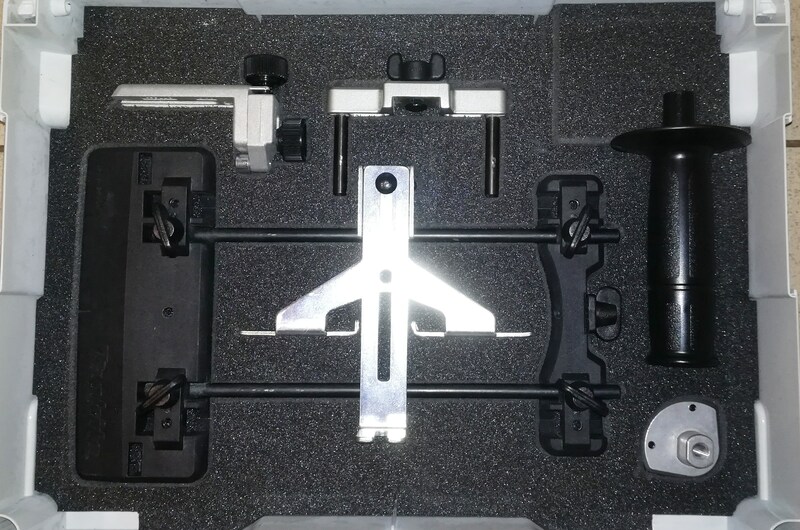 I got and anthracite Sys1 on sale from Woodcraft last year to keep my True Position Cabinet Hardware install jig in. The jig comes in a cardboard box! You can buy a goofy blow molded case for it for something like $30. I like being able to stack, store, and transport everything in a standardized way. 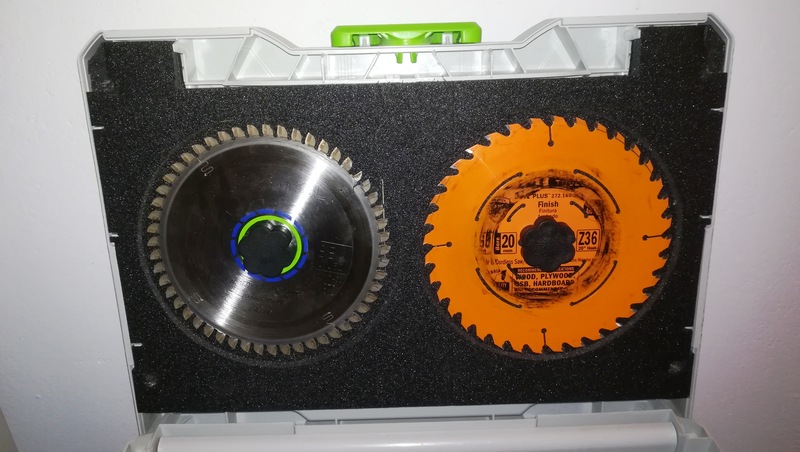 Yes the saw blade storage is perfect!